It’s that time of year again. A month of day-long fasts, and once the sun goes down, the fast becomes a feast. People – irrespective of religion – are seen thronging various pockets of the city to sample some of the best food. With stalls out in the open and restaurants flooding the area with delectable things to eat, you’re definitely in for the time of your lives. Here are five places that serve amazing desserts during Ramzan. Apparently, celebrities such as Kangana Ranaut and Huma Qureshi swear by the hot malpuas, dripping with syrup, here. And for what it’s worth, why not grab some of their famous Aflatoon mithai and rabadi for just that sweet kick that you so rightly deserve. Special Mention: There are times when you just can’t get enough of a good malpua. Badri Sweets, close to Bara Handi, makes a delicious double egg malpua that’s big enough for a family. They then add a dollop of rabdi on top, to make sure you sin the right way. Not to be confused with the Jalebi that you get at Haribhai Damodar Mithaiwala, JJ Jalebi is one of the oldest sweet shops in the city, that serves up some of the tastiest jalebis in town. Mawa Jalebi, which was made famous in Jabalpur, Madhya Pradesh, here has its own Mumbai twist. And, you can experience its magic while exploring the many bylanes of Mohammad Ali Road. Trust us, it’s special! Special Mention: Burhanpur Jalebi Centre serves some delectable mawa jalebis, apart from juicy gulab jamuns and even Manda – a super thin tawa-made roti. Well, what can you say about a 125-year-old institution? Taj Ice Cream is ‘the’ place to have their freshly-made, hand-churned ice creams. The best bit: In summer you can taste the freshness of the fruit while enjoying some rich sinful dessert. Hopefully, that will take the guilt away. Special Mention: Imam Sharbatwala serves some refreshing sherbets with seasonal fruits and flavours that can cool you down after a heavy meal. 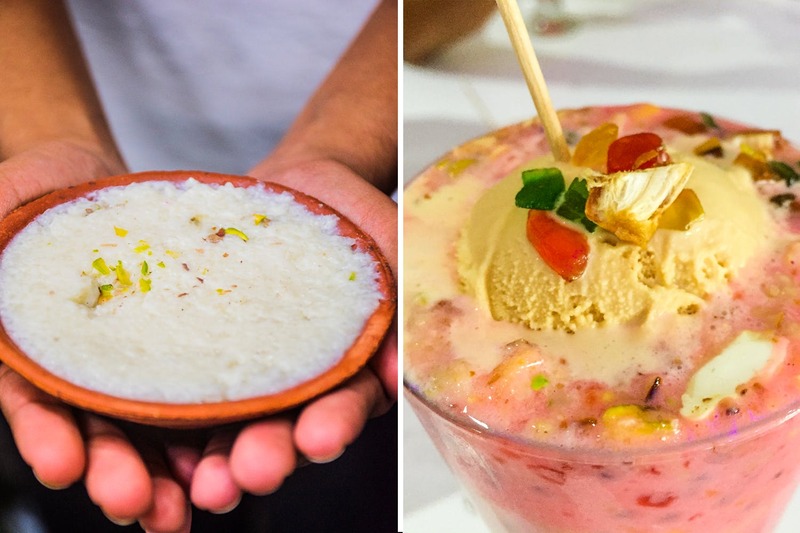 Creamy rich shahi faloodas are not to be missed this season. Now, add some ‘shahi’ to the falooda and you think of food coma. Baba’s at Mahim is the place to go. Don’t forget to sample the dry rabadi kulfi falooda. Of course, we would add Delhi Durbar in this list of places you should visit during Ramzan. Imagine an evening of exploring town, and then enjoying a great meal, followed by the Phirni at this place. Yum! Special Mention: Tawakkal Sweets serves one of the best phirnis in town, along with some delish malpuas.